What is the best pet reflective wear? Knowing how to keep your pet safe and what is the best pet reflective wear, collars, leashes, harnesses, jackets or bandanas is dependent on the environment in which your pet will be outside along with its personality. For many the reflective bandana would be the perfect match for their dog if it were a Doberman Pinscher, German Shepherd or Labrador, but if it was a poodle, it just would not fit. The glow Dog bandana works to reflect light with its illumiNITE technology built into the fabric, but on a poodle or other feminine dog it might be just too macho. If you have a feminine breed of dog a more fashionable match for them in most instances would be the jackets or collars. The Glow Dog Reflective Fido Jacket is made to give maximum area for light to reflect off of while looking fashionable. 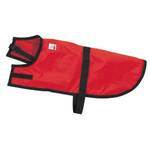 It covers the top of your dogs back along with both sides. This will provide enough area for any driver with their lights on to really see and understand that what they are looking at is a dog whom someone cares about. This also has the illumiNITE technology built into the fabric that reflects light back at the source. This jacket is made of teflon so it is soft to wear for your pet along with being breathable so even on the hottest night you pet will enjoy wearing it when on a stroll with you. If you wish for your pet to attract more attention than just reflecting light from a distance source then the Nite Dawg LED Dog Collar might be a good choice. Instead of needing an exterior light source to make your dog visible, this collar generates its own light with a set of bright LED lights. These lights are placed in an all weather tubing so they will be flexible and weather resistant while providing visibility to others of your pet’s presence from up to 1,000 feet away. For added visibility the collar also has reflective material to bounce light from any on coming headlight back to the driver. This double safet y device is one of the best ways to ensure your pets presence is known to those around it. If you walk your pet on a leash you have two choices. 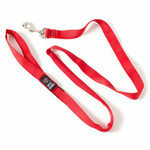 There is the reflective only leash that needs an exterior light source to make you and your pet’s presence known. They come in red, orange blue and black. Each one has the illumiNITE reflective technology built into it so anyone with a light will see your pet and you. For an increased level of visibility this leash can be attached to a harness with the same technology built in. The Nite Dawg LED Leash has the same set up as the Nite Dawg Collar with built in LED lights and reflective material which can be seen 1,000 feet in the distance. The right safety device at night for your pets is decided upon by its owner. Choose what you feel is appropriate for your dog!